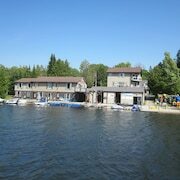 Situated on the waterfront, this lodge is 0.1 mi (0.1 km) from Bruce Peninsula and 2.3 mi (3.8 km) from Ascent Aerial Park. Sauble Speedway and Bruce's Caves Conservation Area are also within 12 mi (20 km). 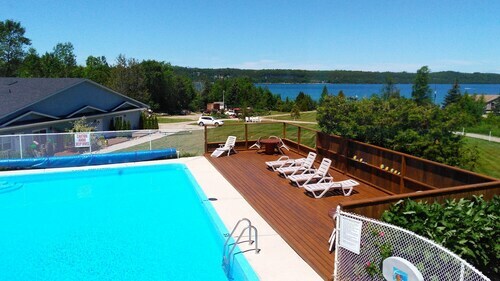 This family-friendly Sauble Beach property is within 2 mi (3 km) of Bruce Peninsula and Ascent Aerial Park. Sauble Speedway is 3.3 mi (5.4 km) away. 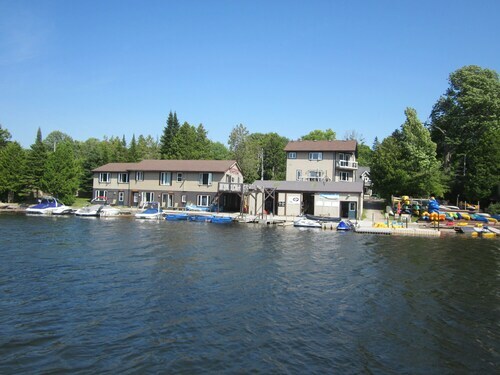 Nestled on the beach, this Sauble Beach motel is within 1 mi (2 km) of Ascent Aerial Park and Bruce Peninsula. Chippewa Golf & Country Club and Sauble Speedway are also within 12 mi (20 km). 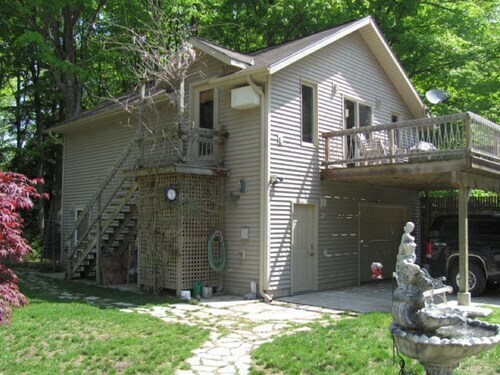 Situated in Sauble Beach, this property is 0.8 mi (1.2 km) from Bruce Peninsula and within 9 mi (15 km) of Ascent Aerial Park and Sauble Speedway. 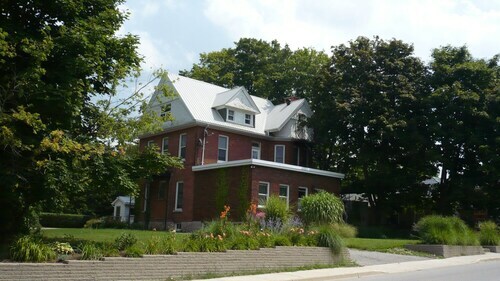 Southampton Art School and Gallery and Bruce County Museum & Cultural Centre are also within 9 mi (15 km). How Much is a Hotel Room in Sauble Beach? 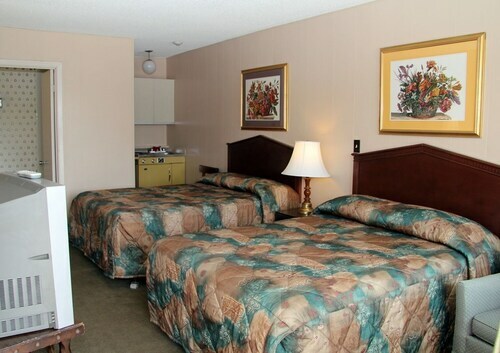 Hotels in Sauble Beach start at C$70 per night. Prices and availability subject to change. Additional terms may apply. Pack your bags—it’s time to embark on a getaway. 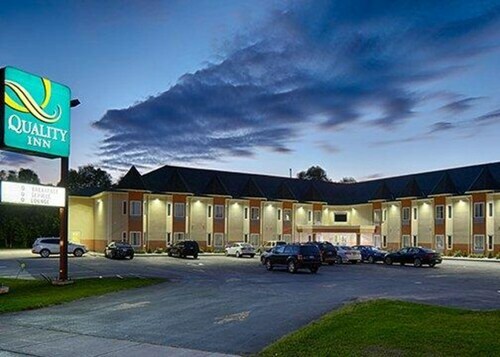 Whether you’re craving a solo retreat or promising your family a vacation to remember, book one of the best hotels in Sauble Beach. These hotels are located within easy access of the city’s hottest attractions and entertainment, so you won’t miss a beat while you’re in town. Spend the days exploring the local landmarks and the evenings getting to know the nightlife. After exploring the city from top to bottom, rest up at a hotel that speaks to you. Find the perfect place that matches your trip’s vibe, from a trendy boutique to family-friendly accommodations. 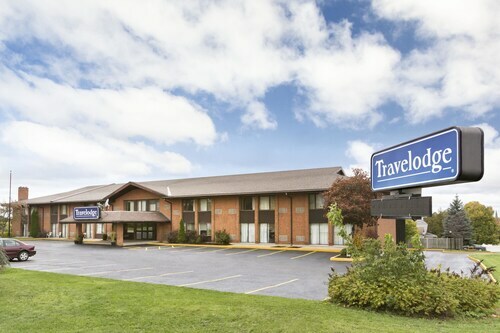 Allow us here at Travelocity to pair you with up Sauble Beach hotels that suit your vacation preferences. Discover places with convenient on-site restaurants, around-the-clock service, and pools where your kids can make a splash. Some hotels may boast fitness rooms and spa services, while others feature game rooms and Wi-Fi access. To top it all off, you’ll score cheap hotels in Sauble Beach that let you spend more on your activities and less on your lodging. Book and bundle your flight and hotel deals together today and save up to $537. It’s time to explore a new city, and break out of your routine. Great location, close to Tim, Walmart, Petro station, 5 mints drive to Downtown. 1.0 Disaster. Rude and totally unprofessional. I booked this hotel via Travelocity and received a confirmation. "Thanks! Your reservation is confirmed. No need to call to reconfirm." But then at 3pm on the day of my reservation, the owner left a message to say that I provided an invalid credit card (it wasn't) and that my booking would be cancelled unless I called by 4pm. I was driving and called him back at 4:07pm, to find out that he had cancelled my reservation, despite the confirmation. He had no other rooms. Despite the confirmation. I booked with my Amex. Turned out he didn't accept Amex. Despite the confirmation. He said I booked via another online agency. I didn't. Despite the confirmation. And he said he couldn't get me an equivalent room, as I had booked (2 beds, one sofa). Despite the confirmation. He was rude and unprofessional and took no responsibility for what happened. He took me to another nearby property (where I had stayed before and specifically did not book). They had no equivalent room. In fact, they said I had their last room. And, again, he was rude and unprofessional. Take it or leave it -- that was the only option. Zero accountability. The room I ended up with, at another hotel, was gross. The attached picture is of the rotting bathroom ceiling. Linens smelled and had cigarette burn holes. And it was not the 2 beds, 1 sofa room that I asked for. No cots allowed in that room, either, they said. All this is why I didn't stay at that hotel in the first place. Take it or leave it. We were in a first floor room with beach/pool view (room 215). The room had a queen bed and futon, and stated it could fit 2-4 people. We had 2 adults, a baby, and a dog. The room was very small and cramped. It also stayed pretty damp (towels didn't dry). The bed was very uncomfortable. We only used the futon for sitting. However, the room had a wonderful view, and the private beach was excellent, with chairs and toys provided to play on the beach. Reading other reviews, it seems that rooms not on the first floor may have been nicer. The hotel was very dog friendly, and the staff was friendly. 5.0 Very comfortable, friendly, quite and affordable. My wife and I had such an awesome experience for our short stay here. The hosts Peter and Miriam were very friendly and welcoming, making sure my wife and I were comfortable. 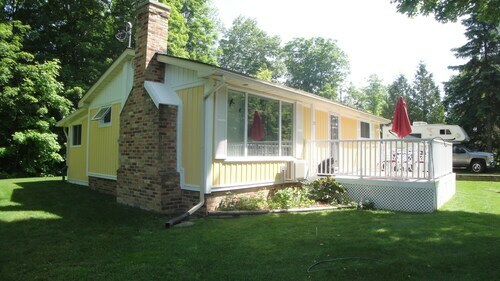 Located in a very quite and beautiful little town of Tara, we were within minutes of the beautiful beaches along Lake Huron and shopping areas. Our rooms were beautifully decorated and very clean. The entire home was beautiful and warm. Our breakfast was excellent, having more than enough to eat. I would recommend this B and B to all of my family and friends. 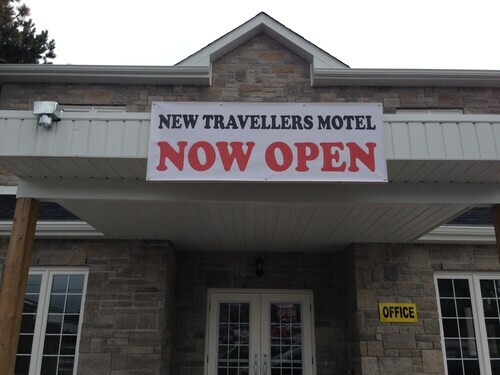 This is a must place to stay for anyone traveling to the Bruce Peninsula. Very very affordable too. Thank you John and Miriam, from David and Mary. 3.0 Clean and adequate but the staff weren't great. We tried to extend our stay for an extra evening. The person who was working was a part time employee and told us she couldn't book the room for us because she needed an authorization code that only the manager had. This was on Thursday night. She promised to call us on Monday night. There was no follow up call. And when I did call, the person told us there were no rooms anyways because the person was mistaken that I had talked to. I tried to check in early, it was not possible which was understandable. However in making conversation, I asked if it was a busy night for them the night before (which was the night I was trying to book previously). She told me that no it wasn't, but they just didn't have all of the rooms cleaned yet from the day before. The front desk service really left a lot to be desired. I will say that I also stayed at the Comfort Inn in Owen Sound. The staff was nicer but the rooms were a lower quality. Both hotels could benefit from ditching the bedspreads, and going with the duvets covered in sheets. It just seems so much more hygienic, I don't know why most places don't switch to this.